How Often Should You Replace Your Machine Tool Windows? If you search the Operation and Maintenance manual for your machine tool, you will find the recommendation is every two years, or sooner if chips or cracks appear. "Why every two years?" you might ask. The safety windows used in machine tools are made up of glass and polycarbonate. Over time, the glass may become pitted and scratched from all of the metal chips. These introduced flaws will cause the glass to have cracks or small craters, similar to what happens when road debris hits the windows of a car. The machine windows become difficult to see through and the strength of the glass is compromised. The polycarbonate will also become cloudy (white looking film), etched, and scratched over time. The polycarbonate will start breaking down due to the coolant, oil, and solvents used plus any impacts that happen during daily operation. The German Machine Tool Builders' Association did a 12-year study on this issue. They found that after two years, polycarbonate loses 40 percent of the impact characteristics. The same study states that protected polycarbonates retain higher impact characteristics, but the window still needs to be changed to ensure proper strength. This may lead you to question, "Why OEM replacement windows?" Michael Lail, Okuma's QA compliance manager has the answer. "Our glass is designed, tested, and meets the requirements by ANSI and ISO (EU). 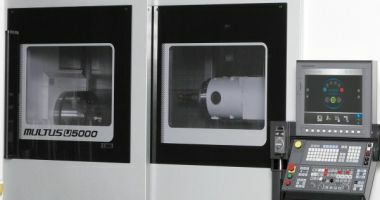 From the frame that holds the laminated window to the Impact Resistance Classes for thickness, OEM glass meets the requirements of the machine tool industry and the needs of our customers."